The Nukak People of Colombia have been forced from their homes by illegal armed groups, in the latest attack against the country’s most recently-contacted tribe. Mining, palm oil, cattle ranching and coca threaten the majority of the country’s 102 indigenous communities. Despite the Colombian government establishing for the Nukak an 855,000-hectare natural reserve closed to outsiders in 1989, it has aimed to convert acquired land from a means of subsistence serving, say, indigenous communities into a profit source for foreign companies, in particular mining concessions. Photo of a Nukak Woman By Piers Calvert. The Nukak People (also called Nukak Makú) in Colombia have been forced from their homes by illegal armed groups, in the latest attack against the country’s most recently-contacted tribe. This follows a report released in 2010 by the United Nations High Commissioner for Refugees warned that more than thirty-four Colombian tribes face extinction due to continuing violence on their lands. The Nukak live between the Guaviare and Inírida rivers, in the headwaters of northwest Amazonia. Some bands still follow long established home-line routes through the jungle, seldom settling in one place for long. They travel light, in small family groups, ensuring they can move on quickly when invaders approach. Their only weapons are blow darts, but they have thus far been able to escape much frontier conflict. The Nukak are accomplished hunters, fishermen, and gatherers, taking full advantage of the land around them. They also practice itinerant agriculture on a small scale. Occupations are divided among tribe members. While men hunt, women and children gather, and the entire tribe participates in farming. They usually make their camps near a water source and where fruit and animals are plentiful. They are careful to move on as soon as supplies begin to decline. In 1988, there were an estimated 1,000 to 1,500 Nukak. Their numbers dwindled as their contact with the rest of the world grew. Felled by Western illnesses such as syphillis and the common cold, they also have been run off the lands that they have roamed for centuries. Today, there are around 250 Nukak who have settled outside of the government reserve, mostly in the outskirts of San José. Estimates suggest that there are about 100 to 200 individuals still in the “protected” area. Colombian policies have effected an unmitigated contempt for the indigenous way of life, for example, “the Cerrejón mine owned by Exxon-Mobil destroyed the entire village of Tabaco in 2001, and displaced all of its residents with the help of armed security forces,” Victoria McKenzie wrote for Colombia Reports. The Nukak People of Colombia need “special attention” to survive, according to a UN report, and were recently run out of their lands by armed militias. Photo David Hill/Survival International. An increase in murders, death-threats, and the forced recruitment of indigenous youth into armed groups are just some of the dangers reportedly facing Colombia’s Indians. 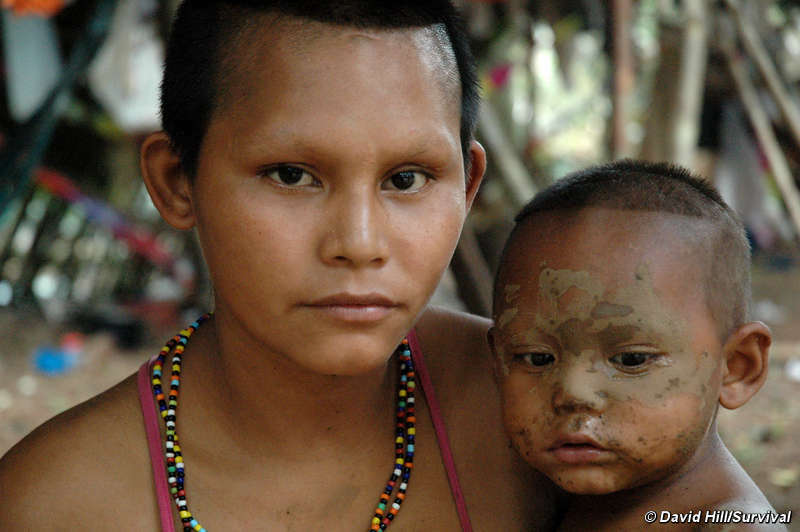 Internal displacement is also cited as a major issue that disproportionately affects Colombia’s tribal peoples. Of the country’s four million internal refugees, Indians make up 15% of the total, despite the fact that they represent just 2% of the national population. The UN outlined the risks mining operations pose to Colombian indigenous communities, and echoes the National Indigenous Organization of Colombia’s finding, presented in 2013, that 66 of the country’s 102 indigenous communities could soon vanish—“victims of a genocide that is forcing cultural and physical extermination.” — Nick Alexandrov, CounterPunch. Just two weeks before the report was released in 2010, leader Luis Socarrás Pimienta of the Wayúu tribe was shot-dead by an alleged paramilitary outside his home in the northern Colombian province of la Guajira. According to the report, murders of indigenous Colombians rose by 63% between 2008 and 2009, and thirty-three members of Colombia’s Awa tribe were killed in 2009 alone. The Awa are mentioned alongside one of the Amazon’s last nomadic tribes, the Nukak, as requiring “special attention.” More than half of the Nukak have been wiped out since the arrival of coca-growing colonists on their land. The Nukak remain trapped in a cruel limbo between oppressive refugee shelters on the outskirts of a town and the violence-stricken forest. An earlier UN report cites a suspected programme of “ethnic cleansing” in the country to make way for illicit crops or “to establish large-scale agro-business ventures, including palm oil plantations and beef cattle production.” Today, add mining interests to the list of genocidal dangers. “We can move around less and less, even to hunt or collect food,” said a leader of the recently displaced Wounaan tribe, who blames the presence of armed groups and heightened violence on an influx of coca cultivation in Wounaan territory.